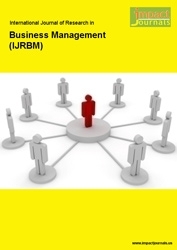 IMPACT: International Journal of Research in Business Management (IMPACT: IJRBM) is an open access, double blind, peer-reviewed and refereed journal in English in the areas of Engineering and Technology, published monthly by Impact Journals in the form of electronic version. The scope of the journal includes Management topics in General Management, Human Resources Management, Information Systems Management, Business Management, Retain Management, Financial Management, Accounting Management, Sales Management, Marketing Management, Production and Operations Management. It is a scholarly journal of opinion and research in academic research. Its mission is to provide an interdisciplinary forum for discussion and debate about academicians researches most vital issues. The objective of the journal is to provide an academic medium and an important reference for the advancement and dissemination of research results that support high-level learning, teaching and research in the field of Business and General Management.